At the turn of the twentieth century, labor movements across North America and Europe were gaining momentum, and the landscape of a post-war society was beginning to shift. Birthed out of this movement came women’s suffrage in the western hemisphere, and International Women’s Day along with it. In the years that followed, this worldwide observance has taken on global significance for women in modernized and developing countries alike, seeking to rally around the common goal of female advancement, both politically and economically. But what does this mean for our Movement? What does this look like from a faith perspective? 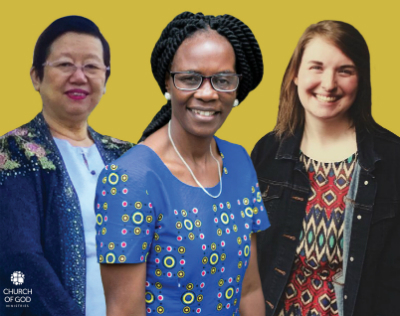 The Church of God has historically embraced women in positions of leadership within the church, and continues to strive to encourage them in their callings—not because our culture demands it, but because we as believers acknowledge the innate likeness of God is revealed in both women and men, and that both genders are not only created, but called to be the hands and feet of Jesus in the world. “I am worthy of having a place at the table because the Lord is the One who empowers, encourages, and equips me to strive after the kingdom,” says Courtney Rice, a seminary student at Anderson University School of Theology and Christian Ministry. Courtney Rice (right) with one of her mentors, Ann Smith. “God calls both women and men to actively participate in building up the kingdom of God. We need each other, and we need to be for each other,” Courtney says, echoing Mailes’s sentiments. Mailes’s story is an extraordinary one—beginning with a humble prayer that ultimately changed her entire community for good. In 1992, Mailes’s daughter Charity became very sick. Everyone in Mailes’s village, including her own mother-in-law, encouraged her to take baby Charity to the witch doctor to be healed, certain that the cause of the illness was consequence to some sort of witchcraft. Mailes and her husband, who were both new believers at the time, refused to comply, deciding instead to pray together over their sick child. 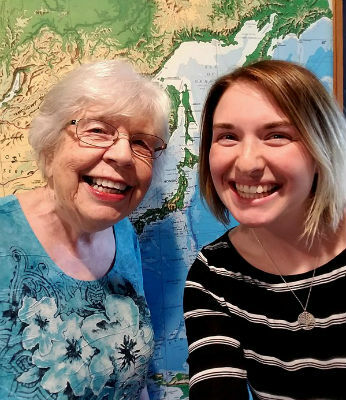 “The Lord answered our prayer and this brought my mother-in-law to believe in Jesus Christ and receive him as her Lord and Savior,” Mailes recalls. Mailes Ndao leading at a recent African meeting (credit: Jessica Hayes). It was during this season of countless miraculous answers to her most desperate of prayers that Mailes began to feel a call to ministry. 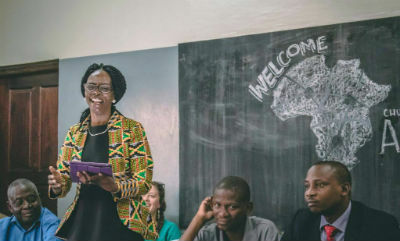 She and her husband responded to God’s prompting by moving to Lusaka, Zambia, where they co-pastored a church and where Mailes served as the national women’s leader. Under their leadership, the quaint little church that started with only five people in regular attendance multiplied to 250. 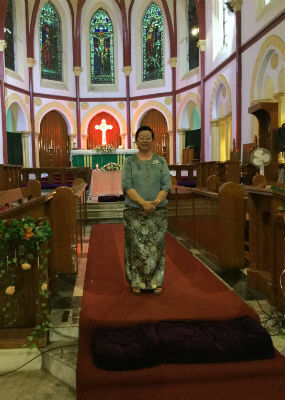 Dorothy Colney, senior pastor and president of the Church of God in Myanmar, is yet another leader among leaders for the international Movement, who strives to emulate the enduring faith of the Bible characters of old. Like both Mailes and Courtney, Rev. Dorothy has given her life over to ministry and, as a result, has fostered robust growth in churches and communities across southeast Asia. Working with Campus Crusade for Christ (CCC) in Burma, Dorothy has trained thousands of college students and church laymen for evangelism, translated a variety of CCC promotional material into Burmese, and preached at more than thirty open-air crusades, where countless listeners received Christ as their Savior for the very first time. From there, Dorothy Colney and the CCC recognized a need to inaugurate a more permanent church ministry in the area, and fasted for seven days to decipher the Lord’s leading. A vacant house was provided to them by a neighboring pastor, which became the first of nine churches they have established. Ten years later, Dorothy was ordained at the Asia Church of God Conference in the Philippines. Already the Church of God is blessed by female and male leaders alike, who are spearheading these integral steps toward inclusion and egalitarianism within the church. It is time that we all stand with them, and for them. Across North America, and around the world, God is on the move in the Church of God. Join the movement. Reach our world. Donate today at give.jesusisthesubject.org. Learn more about the international scope of the Church of God at www.chogglobal.org. This entry was posted in All Church of God and tagged Africa, Anderson University School of Theology and Christian Ministry, Ann Smith, Burmese, Children of Promise, clergywomen, Courtney Rice, Dorothy Colney, egalitarian, evangelism, female, global, healing, international, International Women's Day, leadership development, Mailes Ndao, Mailesi Ndao, Megan DeBruyn, missions, Myanmar, ordination, Seminary, testimony, witness, women in ministry, women ministers, women pastors, Women's History Month, Zambia. Bookmark the permalink.